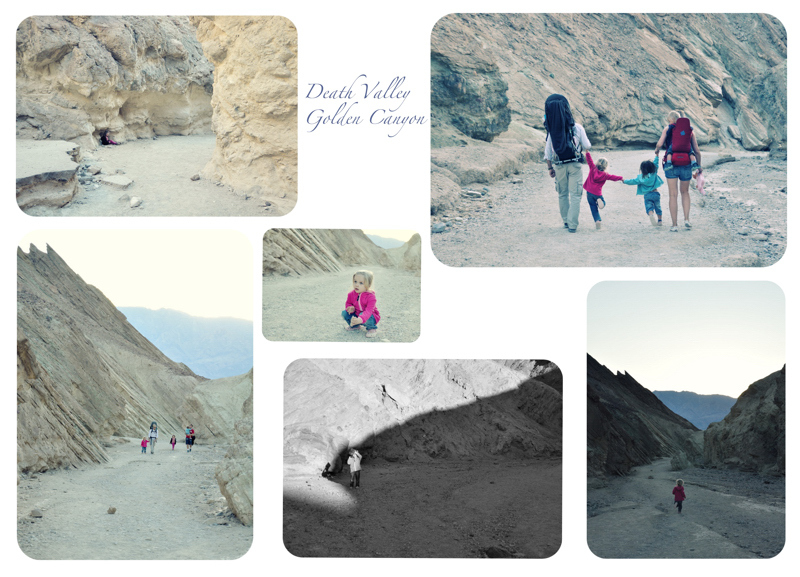 We have spent the President's Day long weekend together with our friends in Death Valley and I would like to share our experience about going there with small kids (there were 5 of them from 1 to 5 years old)). 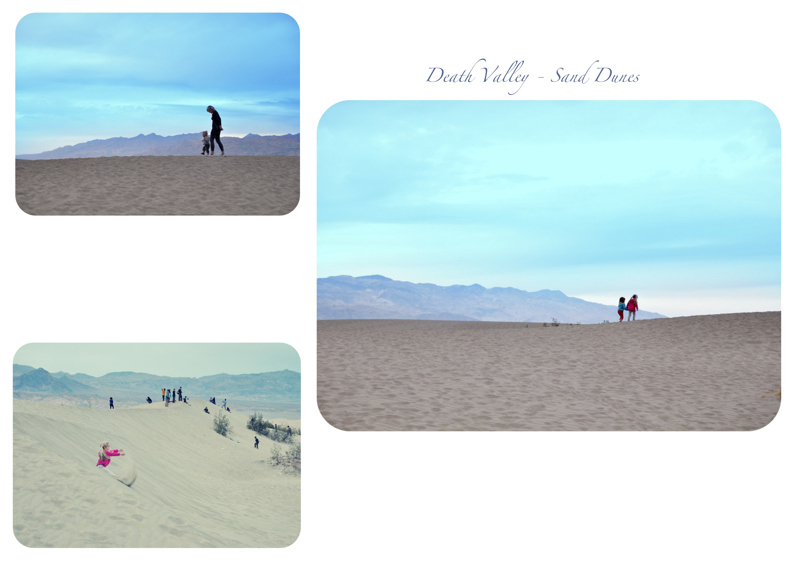 I would also like to show Death Valley in February which by the way is great! Next day we were going to meet our friends in the Death Valley Stovepipe Wells Village around 1pm. Of course everything took much longer than we and they have anticipated and we finally met at 3.20 pm. But before we met, we took Trona Wilderose Rd from Ridgecrest to get to Death Valley. On our way we spotted a sign to Ballarat Ghost Town and as we were still ahead of our friends, we decided to make a stop over there. What a strange place. There were gold mines there at some point, but now there is only one guy living there. His name is Rocky Novak and he lives there with his dog Potlicker. Girls were really happy over there, especially when playing with this big but very friendly dog. The only unpleasant thing were little flies almost everywhere, very annoying at the beginning but bearable at the end of our stay (we were there for almost an hour chatting with Mr Novak who happens to be half Polish half Czech). 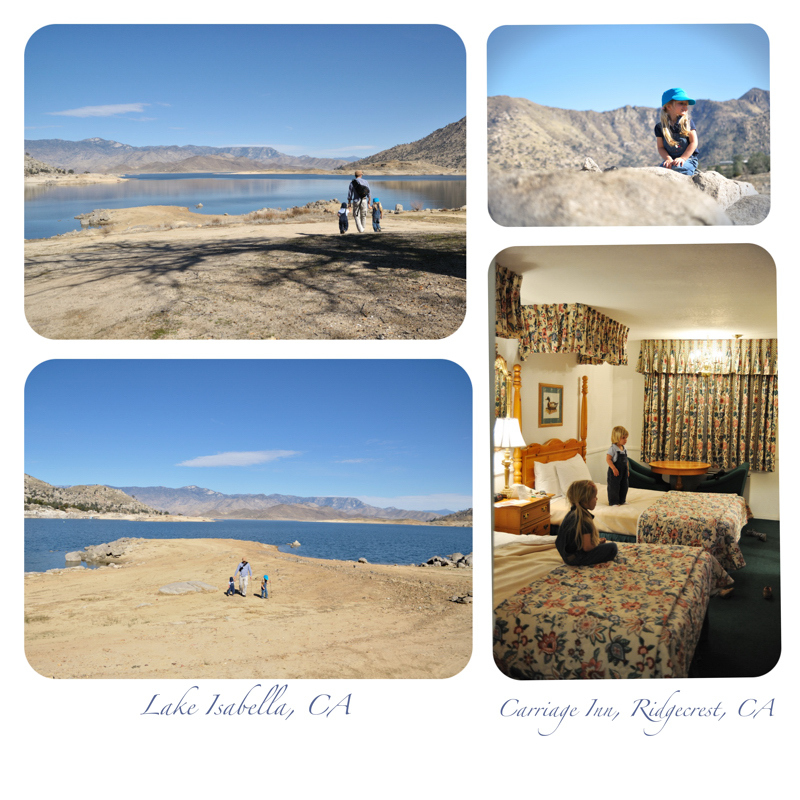 This place is definitely worth seeing and it makes a nice stop with kids when going that way to Death Valley. We have finally met our friends and went for a sunset to the Mesquite Flat Sand Dunes few mintes away from Stovepipe Wells. Except there was no sunset because it was pretty cloudy. I don't have to tell you how much fun it was for kids. Neverending sandpit and small hills to slide down - what else can a child ask for. We had heaps of fun and stayed there till it was completely dark. The only disadvantage - loads of sand in the car. No matter how hard you try, there is still tone of sand on your children after each meeting with sand. And one more thing - because we were there during a long weekend, there were a lot of people so basically you could not take a photo of an untouched dune. 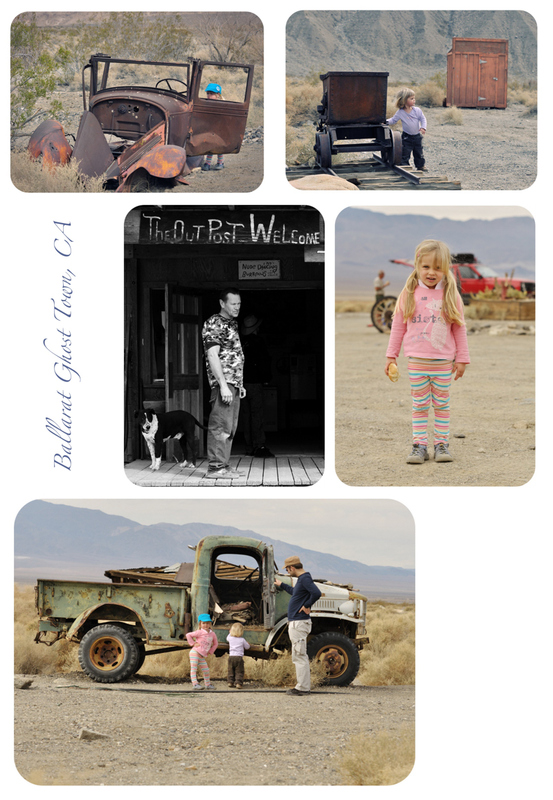 We have spent the night in Beatty, NV (40 minutes drive from Death Valley). We stayed in El Portal Motel just by the entrance to the town. Again, nothing fancy but it was just right to spend 2 nights over there. No problems with booking online, quiet, clean and warm (it was really cold outside). After refreshing we went out to eat something. To be on a safe side, we went for a supper to Denny's. We ordered healthier food and it was our mistake. Instead of waiting max 15 minutes (as other people were waiting for their hamburgers), we waited 1 hour. I complained to the manager and said that we not only expect our food now but also some kind of discount. To our surprise we didn't have to pay for the meal (4 adults and 5 children) at all! 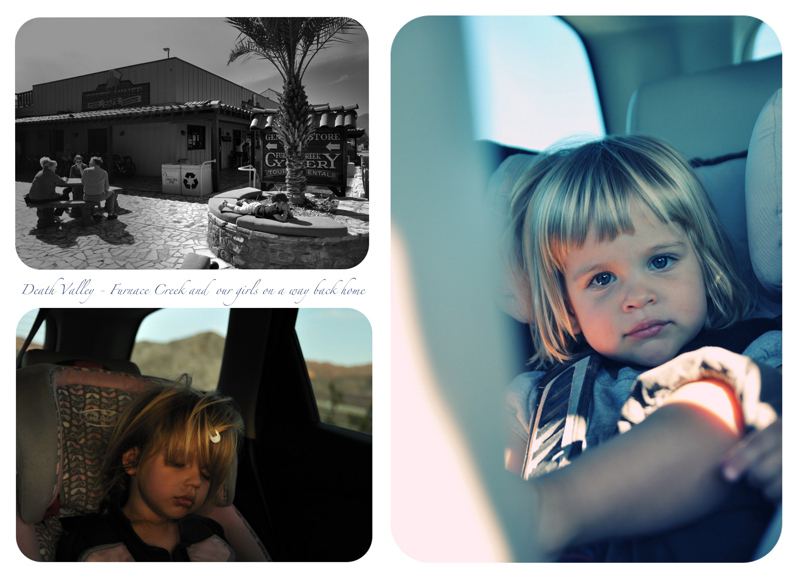 But children were already pretty grumpy so we ate quickly and left to visit Death Valley Nut and Candy shop. We bought the best white chocolate ever! As to Beatty - very small town with a very limited food choice. Both restaurants and shops had a very small choice of healthy food, some fruits and some veggies in one shop at RV park, otherwise sweets and pork ribs only. So if you don't like that kind of food, especially for your kids, bring some supplies with you. 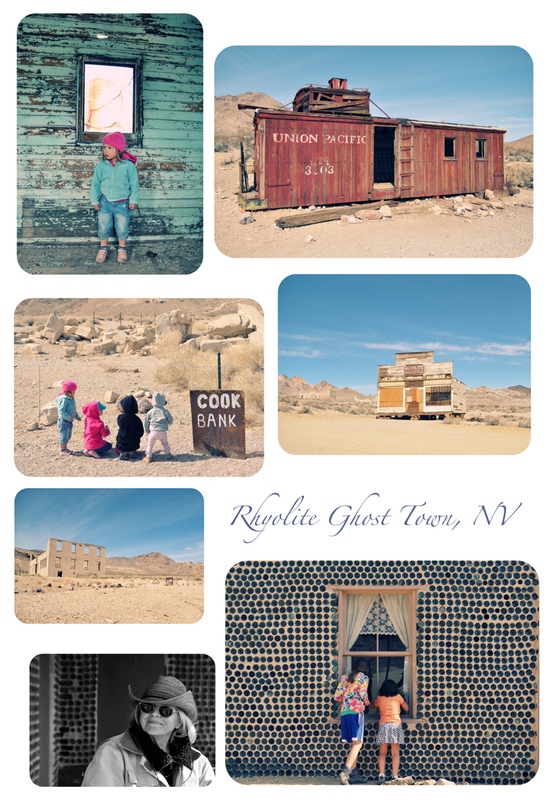 The next day we started off with Rhyolite Ghost Town, NV. What an amazing place and amazing history. Again our children had a lot fun visiting old Union Pacific train car, exploring the bottle house, admiring ruins of an old bank, school and the train station (which isn't in ruin almost at all!). Watch out for rattlesnakes (we haven't seen any) and for barbed wire that surrounds most of the ruins - our girls were very curious about it. We met a lady that lives there on her own in a trailer. She seems to be very warm, chatty and happy person. She answered all our questions about the history of the town. I wonder why she chose to live over there? After visiting Rhyolite we drove at the far end of Death Valley to Badwater. 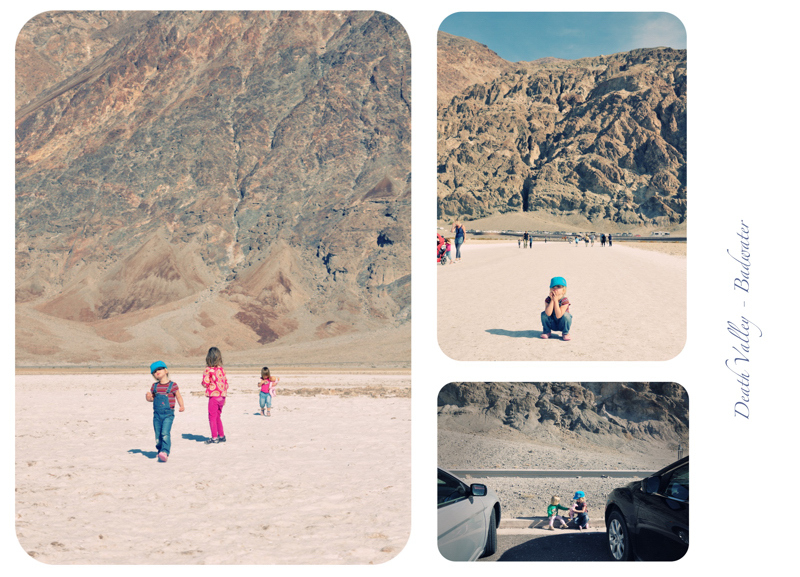 Although it was very hot, our children were very interested in the salt desert and our older daughter kept eating salt. We had a short walk towards the center of the Valley and went back as our girls started to be a little bit grumpy and hungry (partly because the lunch time already passed and partly because of the heat - just to remind you - it was February, it is much hotter in the summer). Here I would like to mention facilities available for tourists. Restrooms are at most major stops (Stovepipe, San Dunes, Badwater, Furnace Creek). These are mostly latrines so don't be surprised by the smell. At several occasions we had to help our girls to pee just by the road. I am not sure if it is ok with Californian law but I don't think anybody minds. There are very few picnic areas so for example at the Badwater our girls had to eat on the curb (there isn't even a single bench to sit on). And since we don't allow eating in the car, it was a bit of a problem for us. There is a picnic area at Stovepipe and I guess there must be something at the Furnace Creek. You can use your all-terrain stroller in most of the places except for the canyons. Over there I would suggest carriers for small children. 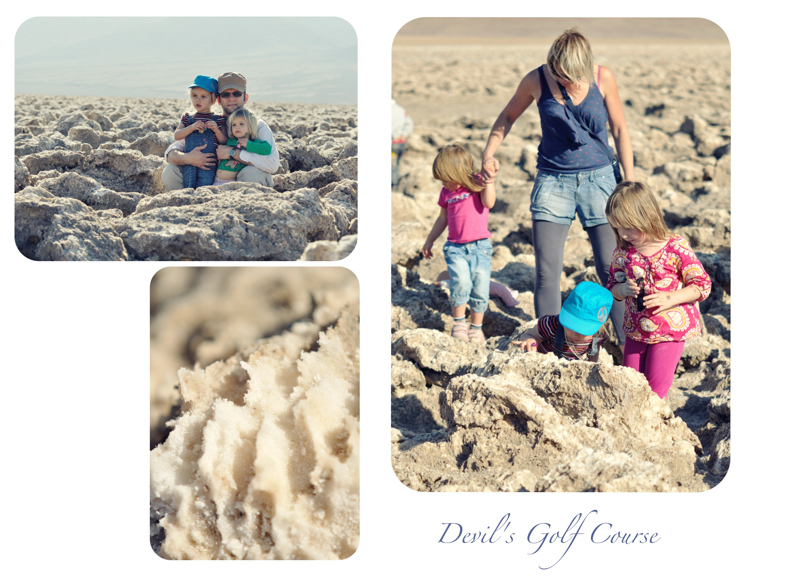 After Badwater we stopped quickly at the Devil's Golf Course. There are very sharp salt formations which are a challenge for children. One has to have eyes wide open and sometimes help your kids to walk on those pointy stones. 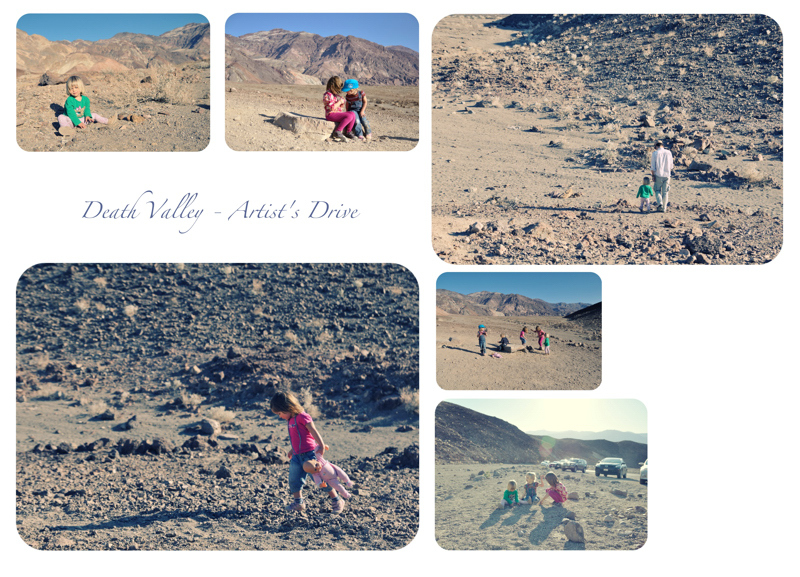 I read on some travel blog that Artist's Drive is boring for kids. Maybe for some kids and maybe when you just drive thru but our children enjoyed themselves - again they were playing with rocks, walking on rocks, running or... admiring their necklaces. Of course, the most part of it is a drive but you can go out at a few spots and have a walk. As the day was coming to the end we arrived to the Golden Canyon for the sunset. It was already pretty empty and most of the canyon was covered with shade. Despite that I managed to take some nice shots. Our girls were already pretty tired and didn't want to explore much. The youngest children were in carriers and therefore quite happy. After the sunset we went to see Harmony Borax Works. Didn't see much except for beautiful, full of stars sky. It was already very cold so after 20 minute stroll, we went back to our cars and drove back to Beatty. On the last day (it was Monday already) we drove to the Furnace Creek Visitor Center and watched a 20 minute movie about the Death Valley. After that we said goodbye to our friends and they drove to Las Vegas and we stayed for lunch at Forty Niner Cafe. Nice and fast service, prices and food acceptable. And they have high chairs for small children. Finally we got home at 12.05 am, very exhausted but also very happy that we have managed to see so many interesting, amazing, powerful and sometimes strange places in just 4 days. Our older daughter Marianna is talking about the trip all the time and keeps asking when we will go on such trip again. vor 150-200 Jahren das war wirklich unglaublich wie die Leute dort leben könnten! Sie mussten sehr stark und beherzt sein! Es macht einen grossen Eindruck! Ich wünche Dir, dass du da wieder kommst!